Our preschool program continues to build upon the foundations established in our toddler program. During this stage, children begin to develop interests and our teachers are prepared to foster those interests with hands-on activities and active learning through the ELLM & STEAM curriculums. 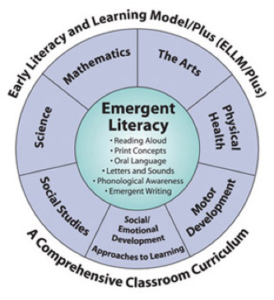 ELLM (Early Literacy Learning Model) The literacy-focused curriculum builds children’s cognitive development through literacy, mathematics, science, social studies, the arts, motor experiences, and physical health. ELLM is designed to expand children’s vocabularies and refine their understanding and comprehension of words they know and use. In addition, we provide a print rich classroom environment through classroom libraries and writing centers. Our four year olds begin journal writing and sight words to provide the basis for a solid reading and writing foundation to ensure Kindergarten readiness. STEAM (Science, Technology, Engineering, Arts and Mathematics) curriculum is intended to engage children in experiences that foster the development of the 21st century skills of critical thinking, collaboration, communication, and creativity. Through developmentally appropriate, hands-on activities, children develop these skills while simultaneously building the academic knowledge needed to be successful in kindergarten. Further, highlighting the connection between what they are learning and real life, children will apply a simplified engineering design cycle to solve problems related to the content they are learning. Center time is also scheduled throughout the day in the preschool program to ensure opportunities for open-ended play, foster decision-making, and social interactions. We believe that learning and speaking a second language is important, especially in our multicultural community. Preschoolers have weekly Spanish lessons as part of their academic curriculum. The teacher conducts the lesson in the language, using a variety of creative materials to motivate and engage children. Traditional songs, games, rhymes, movement activities and storybooks provide the core of the lesson. The language program’s primary goal is the acquisition of a basic, age appropriate vocabulary while using hands-on learning techniques. At Pineview Preschools, we believe that social/emotional development is essential in an early childhood program. Our social/emotional development program focuses on building a positive sense of self in each child, while building positive relationships with their peers. Teachers validate and encourage the expression of feelings in the classroom. Each month our teachers focus on a different character traits including: kindness, respect and responsibility. These character traits are incorporated in the daily classroom routines through books and planned activities, in a meaningful way that children can relate to. In addition to our social/emotional development program, we reinforce these skills by encouraging our students and families to participate in charitable events such as the St. Jude Children’s Research Hospital Annual Trike-a-Thon.